The entire first floor of our mountain home is your private domain. You will find a unique and comfortable apartment with a private entrance. 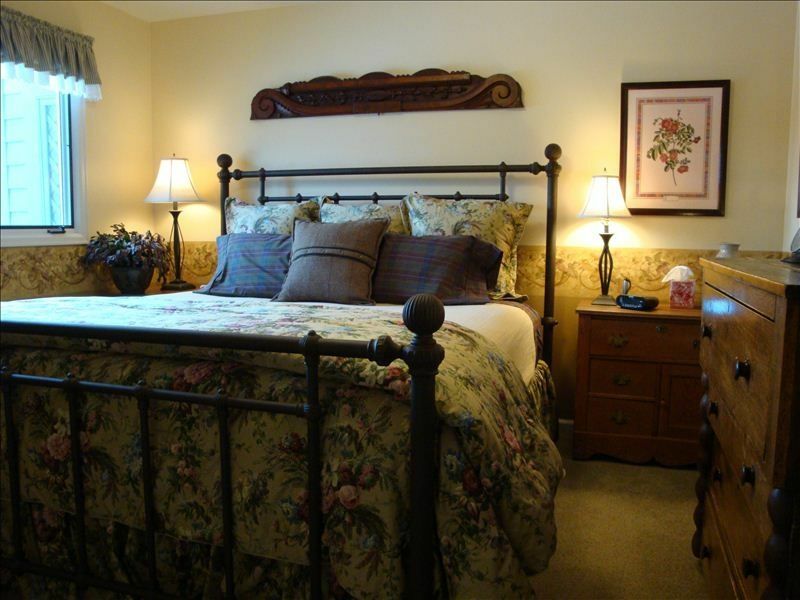 The bedroom is furnished with a high end king bed and designer linens. Your beautifully decorated private living area has a gas fireplace, sofa and a Daybed with trundle. There is a 50” HD TV with HD cable service. There is a fully-equipped kitchen with stove/oven, microwave and full size refrigerator. It is well stocked with dishes, pans, and utensils. There is a full private bath. A south facing flagstone patio located outside your door is great for soaking up sun. There is a patio table and chairs with umbrella, and a gas grill to enjoy our wonderful summers. Washer and dryer are available as well as a ski locker, and plenty of off street parking. (Maximum 2 cars). There is no additional checkout cleaning fee! Located minutes from the Keystone ski area, you can easily ski five other ski areas: Breckenridge, Copper Mountain, Arapahoe Basin, Loveland, and Vail. Our home is located at the end of a cul de sac in a quiet neighborhood just a nine iron south of the Keystone River Golf Course. Great hiking and cross country trails are immediately adjacent to our property. Year round vacation activities. This is your home away from home. Our apartment has everything a traveler needs. Clean, comfortable, well stocked and quiet. We have both been in the hospitality business for 40 years in Summit County. We know this area and all it has to offer visitors. We want our guests to have a fabulous experience. We are a true owner-operated property. VRBO member since 1999! We live in the home and are here to answer questions and assist you in any way we can. We moved to Summit County in 1981 after several winter ski and summer camping trips. We just had to live here! We are 9300 feet above sea level! We are surrounded by mountain peaks. We have plenty of parking! Well stocked with dishes, glassware, small appliances. Table and chairs in living area. Flagstone patio in season with umbrella table and chairs. Many rental choices. Ask us for a recommendation. Ski locker, plush bathrobes, games. Owner paid attention to small details..
Great space with all the comforts of home. Kristi (owner) was wonderful and very helpful. Great location for skiing Summit County. Very welcoming and cozy condo with great hosts! We really enjoyed our stay. The location was easily accessible and made it easy for us to check out the area. The condo was warm, comfy and made us feel at home. We also couldn't ask for more in the hosts! They were very kind, welcoming and helpful. If you have any questions - they have the answers! We were also very thankful for the "Snowberry Way" and cleaning off the foot of snow from our car the morning we were leaving! Thank you!! And the snow has not stopped! 17” last night and still coming down. Thank you for your review. We always aim the help our guests in any way we can. This is the perfect place to go for a getaway to the mountains. It’s just minutes away from skiing at Keystone and close to several other ski resorts,too. Kristi and George are super friendly and offer gracious hospitality. They make you feel like you’re friends— not just customers. The apartment is very private and comfortable and the view of the mountains provides a great opportunity to just relax and catch up with yourself. My wife and I would definitely stay there again and totally recommend it to anyone. It is not surprising that Kristi and Georges have perfect reviews! They are the nicest host you could hope for and their apartment feels so warm, quiet and welcoming. Thanks for allowing us extra time to make plans according to possible snow storm. Priced for double occupancy. Each additional adult please add $25.00/night to nightly rate. Discounts not available during Holiday period. NO ADDITIONAL CHECK-OUT CLEANING FEE!